Psychedelic paintings come to us in many different styles. From minimalisticdesigns with contrasting colors to incredibly detailed fractal geometries, painstakingly represented in oil. Over the years, I have gathered a large collection of my favorite psychedelic paintings from which I use to derive inspiration. I thought I'd share a few of them with you today. I've tried to present a broad enough range of styles here, but hopefully you'll agree they all share that inherent psychedelic vibe. The first time I saw this striking psychedelic image was as a poster on a friend'sliving room wall. 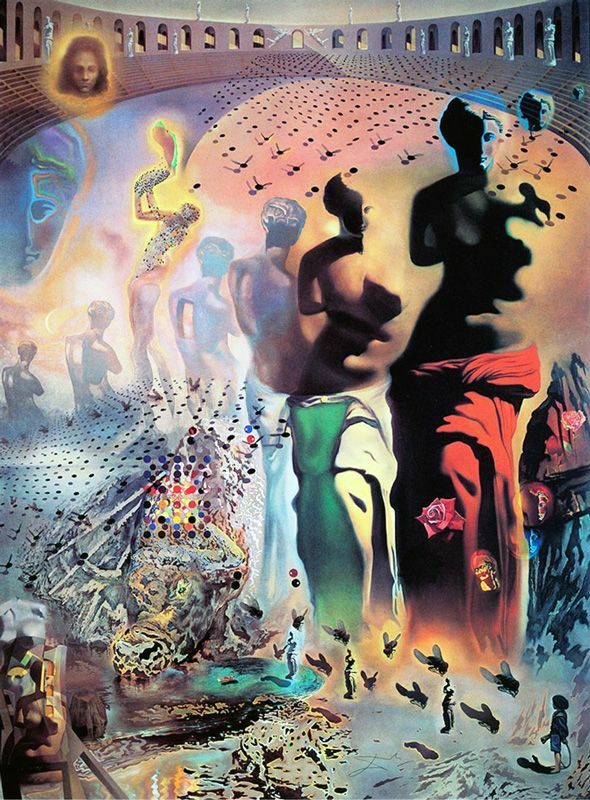 While much of Dali's art is considered to be masterpieces of surrealism, rather than psychedelic, there is no doubting this paintings hallucinatory imagery. Painted between 1968 and 1970, it remains one of the artist's most recognized paintings. Given the painting's timeline, one can imagine the use of hallucinogenic drugs must have supplied some form of inspiration for this work. However, Dalifamously stated "I don't do drugs ! I am drugs !" and that his inspiration resulted from a self developed method he called "Paranoiac Critical Method". Personally, I find it a touch difficult to believe he never did drugs given the type of people he associated with, his lavish lifestyle and childlike curious nature. He was also once quoted as saying "Everyone should do hashish but just once". When one looks past the immediate hallucinatory nature of the painting, you begin to see that it is actually swimming in endless symbolism - a device Dali used throughout his entire career. Housed in Madrid's Museo del Prado since 1939, Bosch's painting from the early 16th century, 500 years ago, easily stands as his best and most celebrated painting. The three piece painting ( commonly referred to as a triptych ) is intended to be read from left to right. It shows God presenting Earth to Adam and Eve in the left section, the middle section displays an indulgent life while the right side reflects society's fall into damnation and chaos. The middle section divides art historians, scholars and critics alike with a wide range of possible interpretations presented over the years. Personally I have no idea what it's about - it's trippy as hell though, that's for sure. 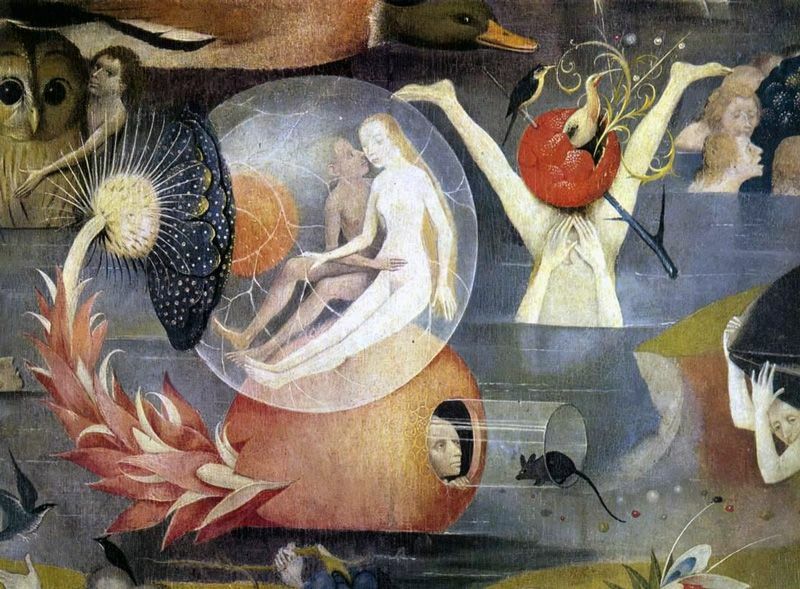 However feel free to browse through hours of interpretation online, including Terence McKenna's interpretation of Bosch's inspiration where he puts it all down to the consumption of psychedelic mushrooms - but then what else would McKenna say. The above image is a very small detail section of the original which is, sadly, too large for me to post here. Do a search on Google images by clicking here to see the full image. Alex Grey is arguably the worlds leading psychedelic artist. His paintings depict direct translations of visions seen during hallucinogenic journeys. The artist makes no attempt to cover up his use of hallucinogens. It's perhaps a sign of the times that he able to do this. I think his openness about it is inspiring in itself. What makes his art so striking is this choice of colors combined with a technical skill level of the great masters. 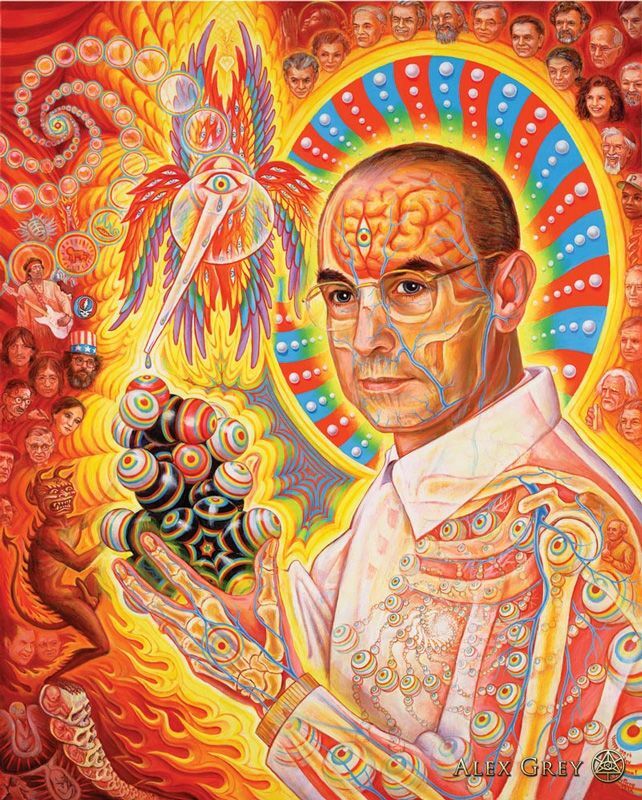 While there a number of images from his extensive portfolio that I could have included in this list, I've gone for my personal favorite - St Albert and The LSD Revelation Revolution. Painted in 2006, in oil, the painting is a brilliant homage to the day Dr Albert Hoffman made his monumental discovery of LSD, an event which changed the world forever - ushering in a generation of free thinking people. Here is a challenge - how may people can you name from the faces within the painting ? 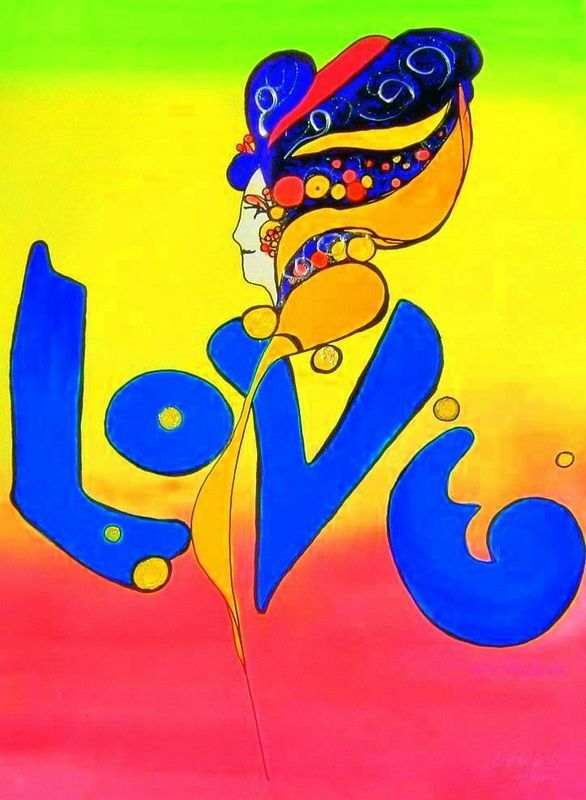 American Peter Max rose to international art super stardom in the 1960s with his bright, bold graphic style steeped in psychedelic color combinations and trippy motifs. His art became synonymous with the late 60s, where his sudden fame led to appearances on TV shows and the cover of Life magazine. 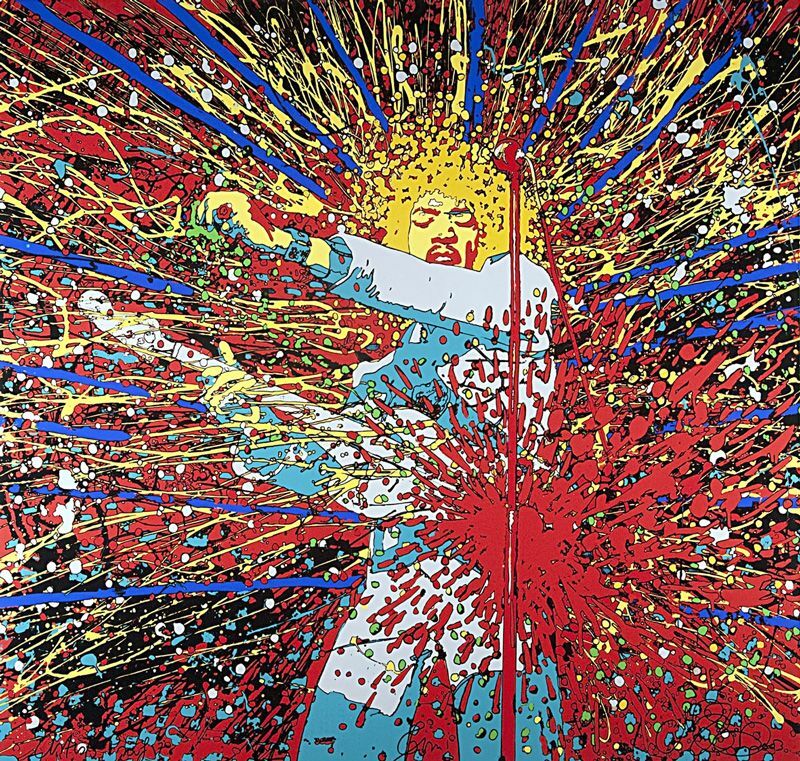 Arguably his most famous work of art, Love, stands as one of the definitive counter culture symbols of the time. He has sold millions of posters, t-shirts and even jeans licensed with his name. At one point in the early 70s he held close to 80 different licensing agreements, turning over 2 millions dollars. That's pretty astounding, 2 million bucks in the early 70s just for drawing what some termed "childish colorful comic art". In the late 60s with the youth culture expressing itself in a variety of colorful ways, Australian artist Martin Sharp produced the definitive Hendrix artwork. The original painting was produced for Big O company in London to be sold as posters. He created it from a photograph of Hendrix playing at a live gig in Central Park, New York the previous year. One interesting point about the original version of the image is that it erroneously depicted Hendrix as a right-handed guitarist, when in fact he was left handed ! Sharp actually redid the image with correct handling of the guitar, fewer splashes of color and a change of clothing color too. He was never really happy with the reworking, even though it went on to sell bucket-loads of posters. If you compare the original and the reworking you can definitely see the difference. I am in agreement with the artist here - the original ( presented above ) is the best. Before his death the artist redid the painting a final time. This time with the original colors, patterns and correct guitar positioning. It too is a joy to behold but I still love the Pollock like beauty of the original, captured at such a culturally significant time in history. Victor Moscoso is a Spanish/American artist who rose to fame in the 60s and 70s with his use of photographic collages layered in his distinctive psychedelic color combinations. His real skill lay in selecting the right mix of colors, colors subtle enough to create saturated and vivid contrasts, without tipping over into a garish assault. He is best known for the early work he did for production company The Family Dog and seminal psychedelic groups such as The Doors and The Grateful Dead as well as his own Neon Rose series. He has continued to apply his trade in the art world into recent times having provided cover art and posters for various modern bands. 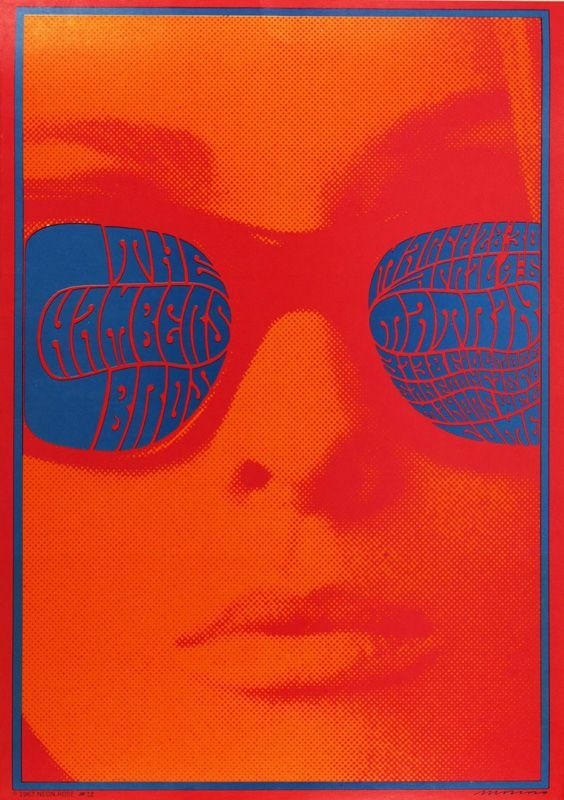 For this list, I've gone with his most iconic image - Neon Rose #12, a poster created in 1967 to promote American soul band The Chambers Brothers. The image is so epic in trippy simplicity and design and perfectly defines that 60s psychedelic counter culture style. It has been used in countless magazines, catalogs and museum promotional materials over the years. It's fair to say that after fathering 17 children, visionary artist Ernst Fuchs knew a thing or two about the human condition. A lifetime of joy and sorrow is encapsulated in his artwork. This is no more evident than in his massive magnum opus The Apocalypse Chapel. This isn't something you can readily hang on a wall. In fact this is a series of painted walls ! 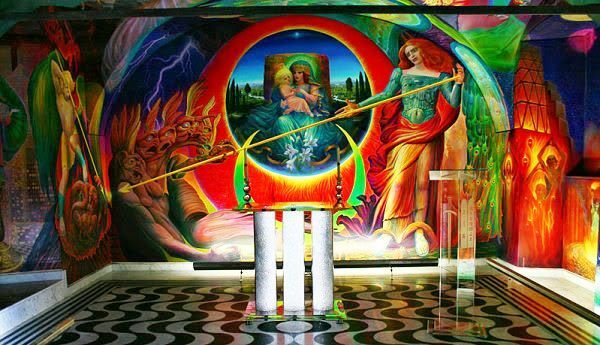 The Ernst Fuchs chapel took the artist 20 years to complete. Started in 1998 and completed in 2009, the 160 square meters of oil painting sprawls out like a hallucinatory visionary dream. The artwork decorates the walls of the south chapel of St. Aegidius parish church in Klangenfurt, Austria. As the name suggests it depicts the story of the biblical Apocalypse ( the 12th chapter of John's Book Of Revelations). During the entire process Fuchs took on a number of apprentices to train and work on the chapel painting including modern visionary artists such as Andrew Gonzalez, Amanda Sage and Laurence Caruana. Again, you will need to research this one online some more to get a better view of the entire image. Pablo Amaringo was one one of the worlds leading visionary artists. He created a unique and instantly recognizable style of art through which he depicted many of the visions he experienced, guided by the inspirational power of Ahahuasca. His paintings, like this one, are always vast in scope and vibrate with intense colors. 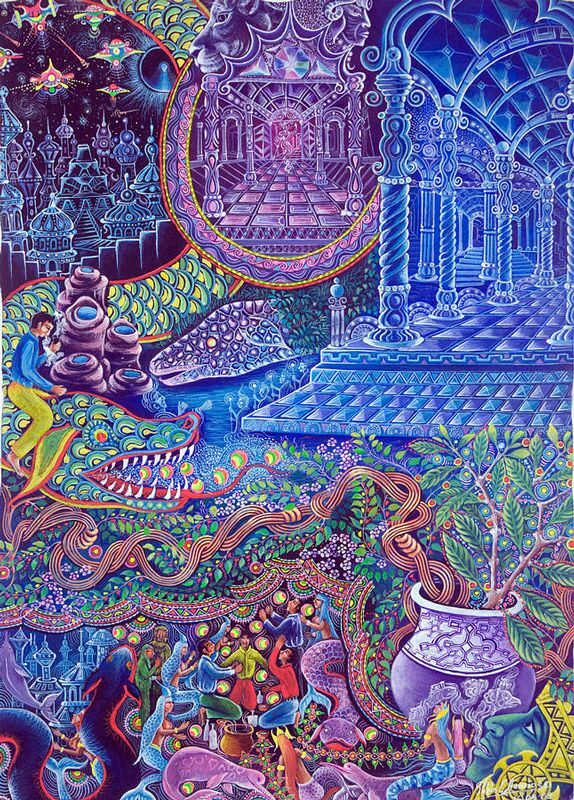 In this painting, Pablo describes an otherworld of crystalline temples, shimmering cities, serpent like entities and portals to other dimensions of time and space. 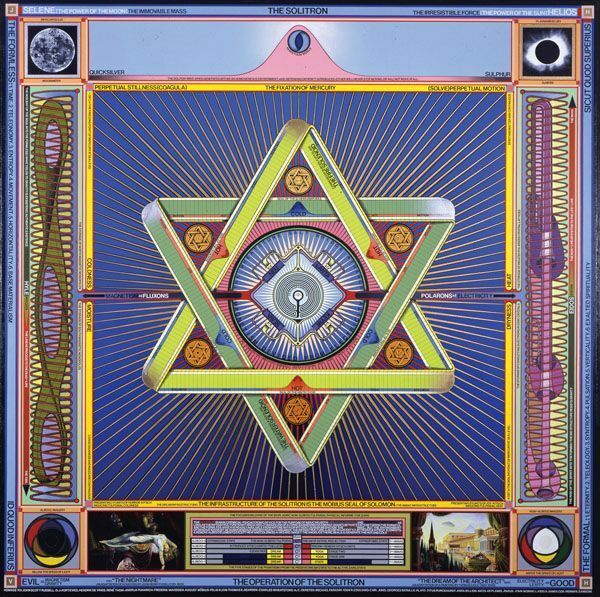 Paul Laffoley is an interesting chap. His art is an expression of various styles and theories combined into an eclectic visionary tale of the cosmos. He is educated in fine arts and architecture and you can see elements of both in his art. He also says that ideas in his artwork might be the result of a metallic implant found in his brain during a routine CAT scan ! He has no recollection of how the implant got there, much like Dana Scully from the X-Files, and suggests it could be of alien origin and his driving his thought processes ! 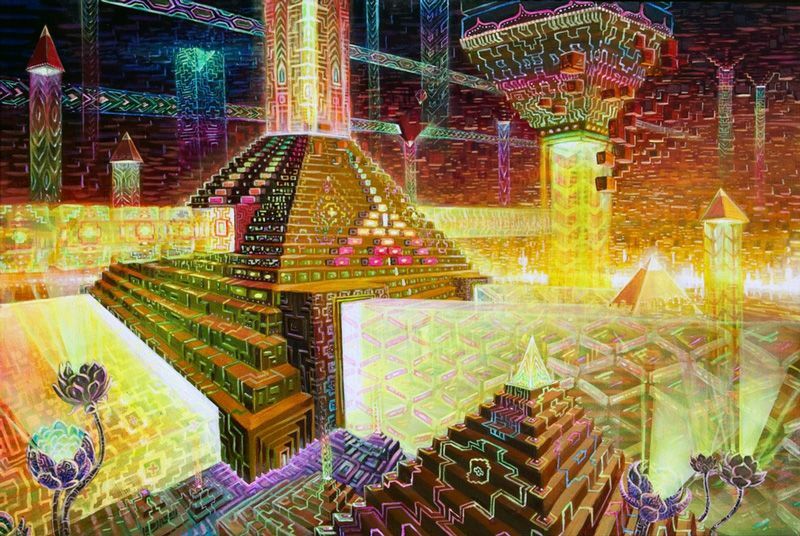 American artist Jonathan Solter burst onto the scene with a series of epic psychedelic paintings that depicted visions of the psychedelic experience. I was instantly attracted to his work as it very accurately reflected themes that I had personally experienced during such events. For me, three dimensional fly-by landscapes of sharply cut geometric structures thatpulse with energy and light are common motif while navigating a psychedelicexperience. As a young artist, Johnathan has already attracted much attention and many followers online. Let's hope he can continue to share his visionary insights long into the future.